It was surprising as a new member and one that sits on the committee that there was so very little information about the history of the society - let alone its founder. Sadly, I thought, the history and stories had been lost over the generations TLAS has existed (since 1989). Well the recent annual Robert Doyle Memorial Trophy triggered a search for more information, duly aided by our president. The following is not only an inspiration, but at long last a recognition for the founding of Tuggerah Lakes Art Society by Robert and by what he's achieved for an enduring culture for artists within our district and the Central Coast. 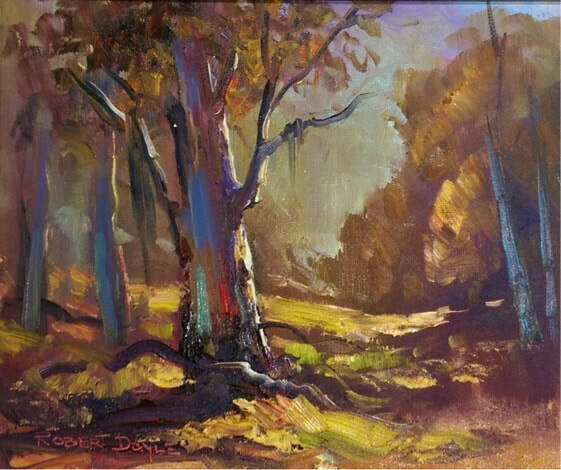 Robert Doyle hails from the clan of Australia's most talented and inspirational artists. 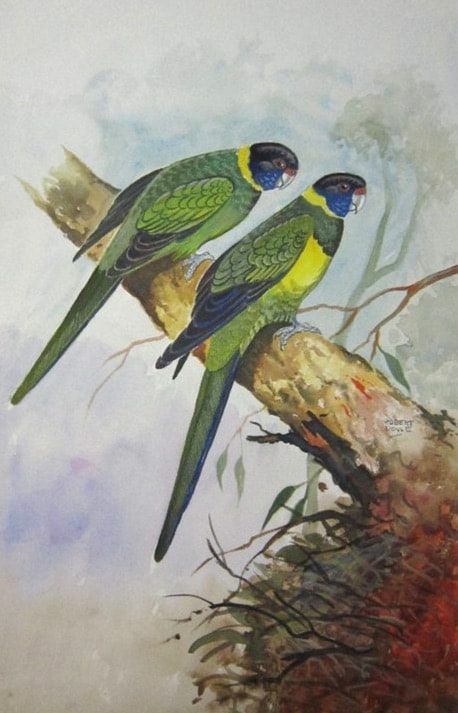 His father Roy B. Doyle was also a highly talented and recognised artist, having received international acclaim for his illustrations in 'A Field Guide to the Birds of Australia', authored by Graham Pizzey. Roy B. Doyle displayed his diversity through commissions requested from large Australian Corporations such as BHP and Shell Australia. The renowned Australian artist D'Arcy Doyle was also Robert Doyle's cousin. Growing up, Robert Doyle won a scholarship at the age of 13 to the prestigious Slade School for Boys in Warwick, Queensland where he excelled in a number of athletic pursuits including track & field events, swimming & diving, rugby league and boxing. Doyle's inherent artistic talent was evident at an early age as he spent long hours sketching and drawing the world around him. After boarding school, Robert worked on cattle stations in South East Queensland, eventually going droving throughout Queensland and Australia's Top End. 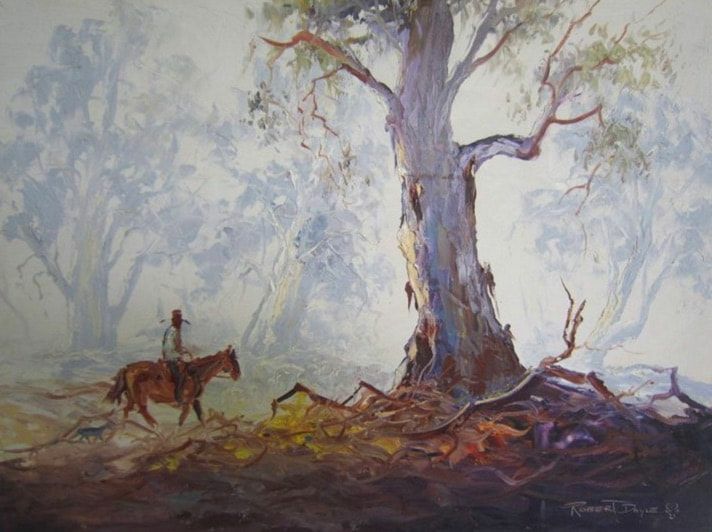 Robert's time droving deepened his appreciation and love of the Australian bush, its characters and the native wildlife. These experiences are evident in his landscape and droving scenes. 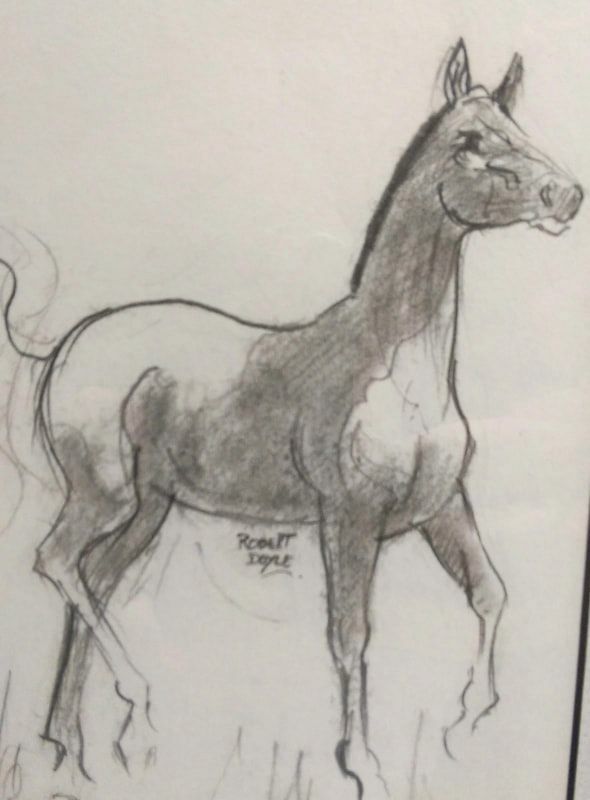 ​Doyle was also a proficient horse-breaker and his experiences are brought to life again through his artworks. Robert's droving led him into Arnhem Land. Here, at the age of 18, Robert lived with the Aborigines and was initiated into the 'Yarrunga Jarra Tribe'. This experience had a profound effect on Robert and gave him a richer perspective on both life and the land surrounding him. Roberts artworks include numerous portraits of Indigenous Australians. Eager to pursue his passion for art, Robert travelled to Victoria to undertake studies at The Art Training Institute of Melbourne. To support himself whilst studying, Robert gained employment as a Commercial pilot crop dusting and later as a Ranking captain with an Australian airline flying DC3 and Avro Ansons. Upon completion of his art studies, Robert returned to Queensland with his purchase of a share interest in a cattle farm near Roma. 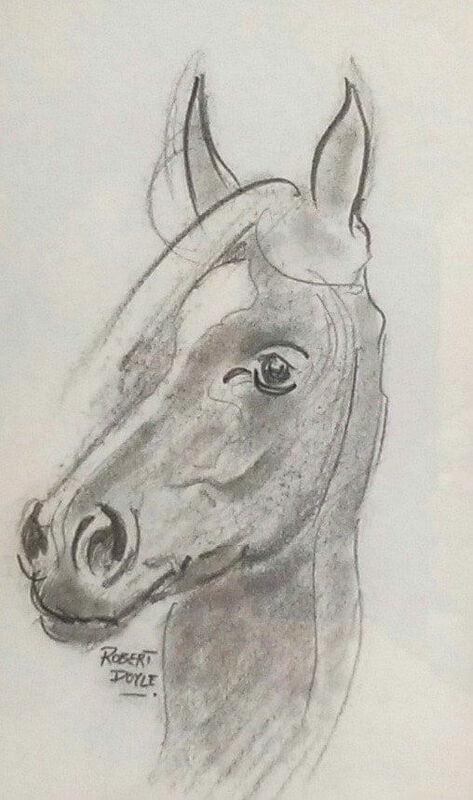 He developed the farm for several years before taking up a position as a technical illustrator and photographer in charge of illustrating catalogues and advertising in national newspapers and magazines. 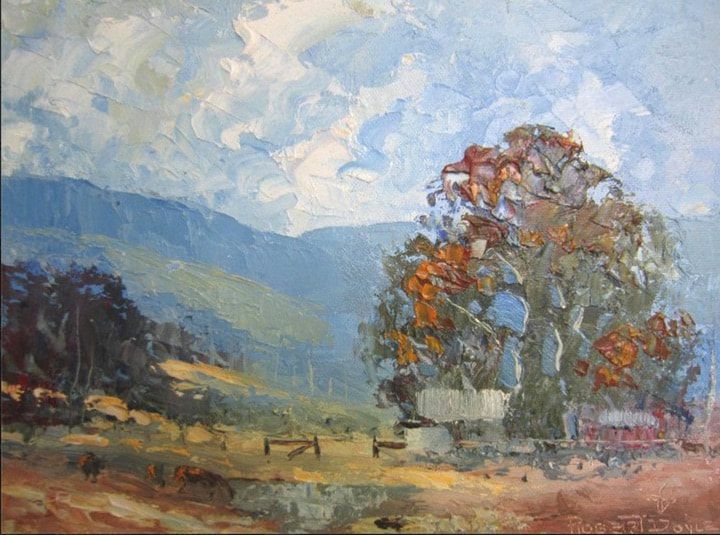 Robert continued to paint throughout this time and gained a reputation as an artist of excellence, winning numerous awards. In 1964 the Premier of Queensland, the right Honourable Frank Nicklin, unveiled Robert Doyle's War Memorial Mural. The mural depicts scenes from World War I and World War II. The project was a labour of love for Robert who spent each Sunday for two years completing the mural. Other mural works were commissioned by private collectors, community bodies and government organisations. Robert eventually settled on the Central Coast of NSW with his wife Patricia and five children. Robert was a bush poet and storyteller and relished his family time reciting poetry and singing ballads. He became the Art Director of a gallery in Newcastle before later establishing his own studio, 'Stockman's Gallery', at Old Sydney Town in Gosford. 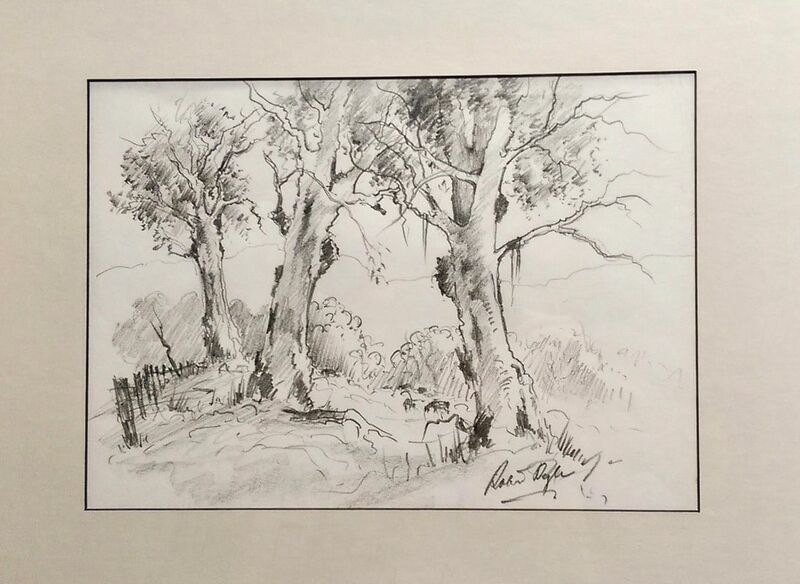 It was at this time that Robert engaged as a freelance commercial artist illustrating for various magazines, newspapers, commissioned works and also as an illustrator for Collins Publishers Australia. Robert extended his range of works to include the ocean and marine life. He illustrated the book, 'Coastal Australia', authored by Brian Mackness. Robert developed an affinity for the sea and reflected this connection throughout his oceanic art. 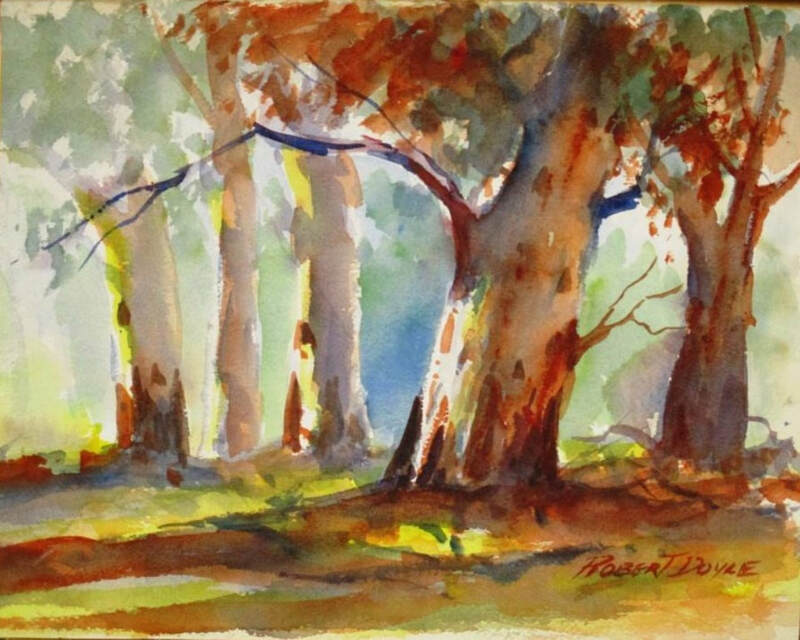 Robert Doyle mastered a diversity of techniques in a wide variety of styles and mediums. 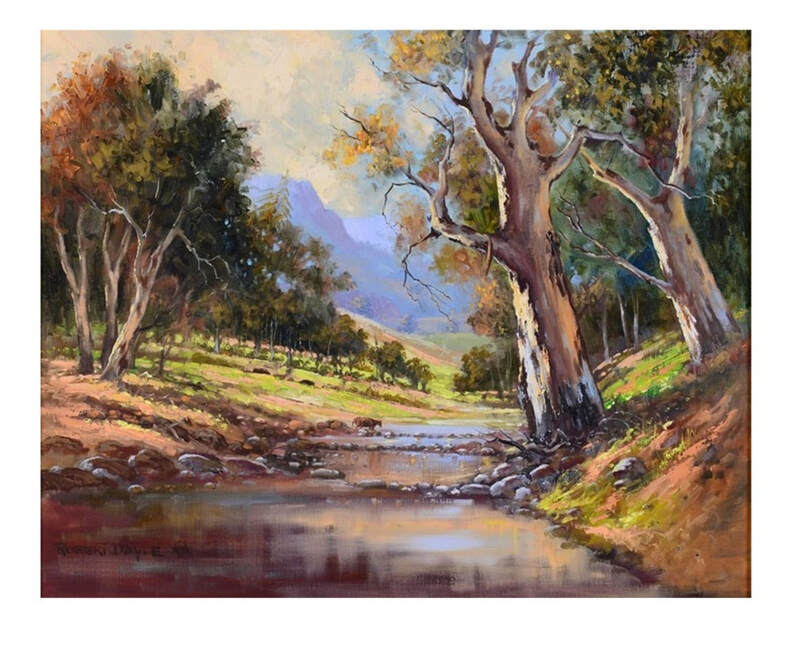 He has held numerous successful exhibitions in Queensland, New South Wales and Victoria. He has received many awards for his artwork throughout Australia and overseas. Robert Doyle is represented in collections throughout America, South Africa, Japan, Canada, United Kingdom and Australia. Robert's work is also featured in 'Australian Artists Today - 3rd Edition'. 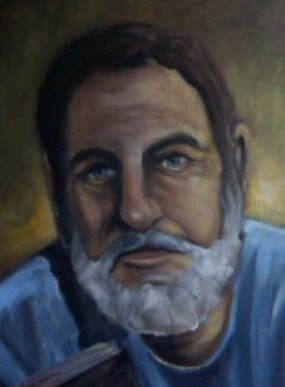 Robert Doyle has a passion for promoting the appreciation of art and developing art technique. He spent many years tutoring and presenting workshops in his endeavour to encourage both emerging and established artists. 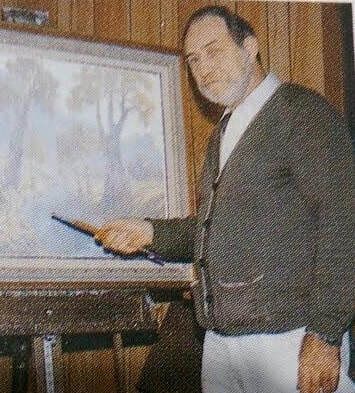 He was a founding member of both Toukley and Tuggerah Lakes Art Societies. Robert succumbed to cancer in 2003 and is remembered fondly by all who came in contact with his generous nature. He lives on through the memories of those he inspired and through his art. 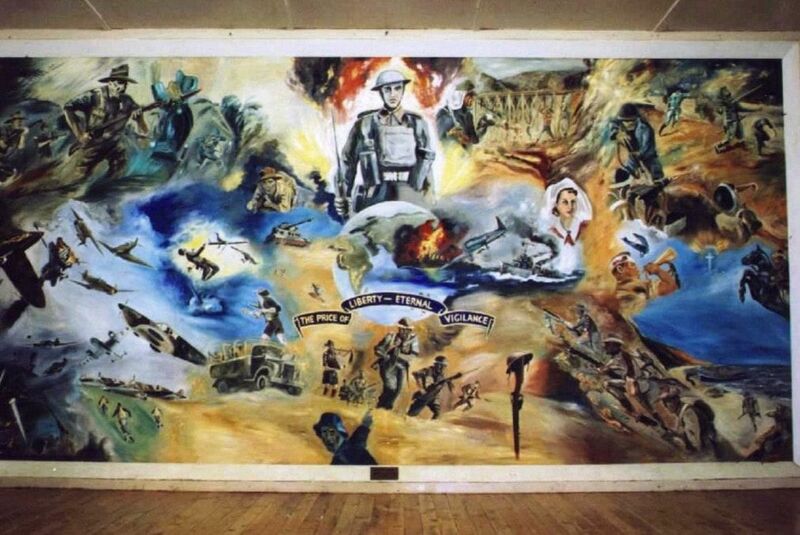 This incredibly detailed mural depicting many theatres of war was painted by a jackeroo, Robert Fred (known as Fred) Doyle in 1964, and is the backdrop to the stage of the Memorial Hall. It was unveiled by Hon F G R (Frank) Nicklin, MM, LLD, MLA, Premier of Queensland, on 9.10.1964. At the centre are the words of the RSL Motto - The Price of Liberty - Eternal Vigilance. Scenes depicted are jungle warfare, Battle of Britain, desert warfare, air, sea and tank battles, advancing Australian troops in tin hats with bagpipes in background and German in foreground, tin helmet on upturned rifle, the globe, bridge on the River Kwai, a nurse, bugler, landing on Gallipoli and ghostly crosses.